I pass by this house every day going to work, and I always noticed it and always sort of thought to myself, “Huh. There’s a red caboose in their backyard. That’s mildly interesting.” Until one day the full import of what I was seeing finally hit me, and I practically slammed on the brakes as I passed and I thought, “Dang. These people actually have a real live red caboose in their backyard!” I mean, this is the real thing — exactly what you might see on real live railroad tracks. But it’s just sort of sitting there in these folks’ backyard. And I immediately want to know: Why? And, how? And, of course, where can I get one, too? Because I know I would be the Best Grandma Ever in the Whole Wide World if I could score one of these. 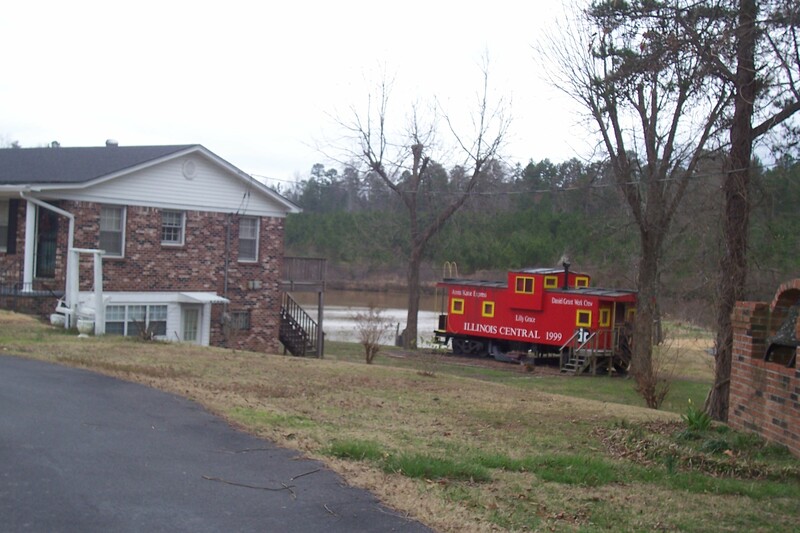 This entry was posted in family, home, Mississippi, travel and tagged Alabama, Caboose, children, grandchildren, Mississippi, Railroad, Track (rail transport), Train, yard decor by Coffee with Cathy. Bookmark the permalink. You could open up your own Chattanooga C. C.
Darn it, I’ve been singing “Pardon me boy, is that the Chattanooga choo choo? Yes sir track 29………….. Chattanooga choo choo won’t you choo choo me home for the last hour. Mary — Glad I could liven up your day! I just love seeing what other people have in their yards and often wonder about the stories behind them. There must be one about the caboose. You are so right, Carolyn! I should just go knock on their door and ask.